Based on reviews from 51 experts and 434 users. 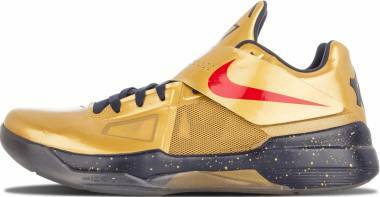 Learn how our rankings work or see our guide to gold basketball shoes. Updated Apr 2019. Footwear way back was mostly of processed animal hide now referred to as leather.Colored shoes started to appear around the middle ages when the process of dyeing leather was introduced. A few decades later, during the 1600s, shoes with decorated fabric in a variety of colors were widely available. Since then, the evolution of the colored shoes has continued, and it has brought us a plethora of colored uppers that we can choose from. Jordan, Nike, and Adidas are arguably the top three shoe brands today. Listed below are some of these brands’ iconic basketball shoes that are bathed in gold. His Airness Michael Jordan was the best there ever was. His shoes simply take after that greatness. End of story. Released in 1991 and known to be the Air Jordan sneaker that his Airness was wearing when he, together with the Chicago Bulls, won his first NBA Championship title against the Los Angeles Lakers in a 4 to 1 series. Not only that, Jordan was also awarded his first out of six Finals MVP. The shoe had a similar look and feel as the Air Jordan 5. However, several elements are added and refined at the request of MJ. One of which is the removal of the extra material on the toe called the “tip”, bringing about a new way of manufacturing shoes and creating a cleaner look. Another addition is the rubber-top, two-hole, pull-on tongue and the molded TPU heel pull-tab in the rear. Both are integrated into the shoe’s design as Jordan wants something that would make putting on the basketball sneaker easier. The form of the heel pull-tab took inspiration from MJ’s Porsche 911’s wing spoiler. In 2015, filmmaker and actor Spike Lee, who played Mars Blackmon in the movie “She’s Gotta Have It” and starred in several Air Jordan commercials, was finally given what many consider as his “long-overdue” Academy award. In honor of this, Michael Jordan and the Jordan brand gifted him a one-of-a-kind Oscar Edition colorway of the Air Jordan 6. The shoe came in an Oscar-inspired metallic gold upper with icy translucent pull tabs and sole that is also speckled with gold. Unfortunately, the Oscar Edition is quite hard to cop. Good thing there is another Air Jordan 6 colorway with a similar look. 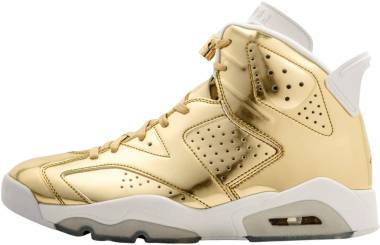 The Air Jordan 6 “Pinnacle” is also dressed in an all-gold upper, but instead of icy blue ones, these all gold basketball shoes feature white pull tabs. Michael Jordan is privately called by his friends as the "Black Cat" as he played just like the feline; sleek and undetected, he would readily pounce on his prey without anyone knowing. Legendary footwear designer Tinker Hatfield didn't know about MJ's nickname, but he coincidentally likened his Airness to a panther while watching one of his basketball games. This sparked an idea for Hatfield as he sketched up the new design of the then upcoming Air Jordan 13. When Hatfield shared the idea with Jordan, the NBA superstar immediately loved it and told Hatfield about his Black Cat moniker. Such is the story of the animalistic feel and unique design of the Air Jordan 13. The shoe takes inspiration from the feline's eyes, paws, and head. The Jumpman-bearing holographic jewel on the lateral side of the shoe mirrors the Black Cat's eyes while the shoe's sole resembles the animal’s paws. Although not officially stated, some claim that when you put the shoes together and take a view of them from behind, the silhouette of a panther's head is formed. As for the 13's technologies, a carbon fiber midfoot shank is embedded in the Phylon midsole together with the forefoot and heel Zoom Air units. Depending on the colorway, the shoe’s upper can be made of suede and woven textile or top-grain leather. Released originally in 1997 with five high-top colorways, the shoe was retroed in 2014 and continues to be released in different versions up to the present. 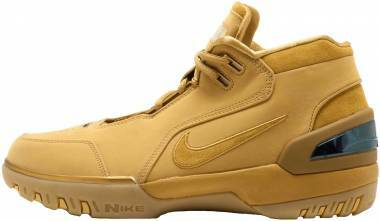 The “Golden Harvest” colorway was a winter holiday release. It rocks an elemental gold/baroque brown upper and a gum yellow outsole. These gold basketball sneakers witnessed Jordan win his fifth MVP award and lead the Chicago Bulls to a third consecutive championship win, this time, against the Utah Jazz in a 4-2 series. This was the last Finals appearance for the Chicago Bulls as Jordan retired for the second time in 1999. Nike has a signature shoe deal with royalty, and his name is LeBron James. 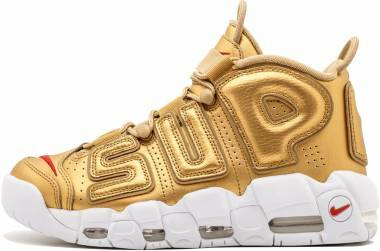 It’s not a wonder that the King has many of his signature shoes in gold colorways. The subsections below discuss not only LeBron’s shoes but also other high-performing gold colored basketball shoes. As a follow-up to the Nike Air Foamposite One, the Pro sports a similar silhouette but added a Nike swoosh on its lateral side and removed Penny Hardaway’s 1CENT logo. The shoe is the second of its kind to feature a shell-like upper that is inspired by the beetle. Back in 1997, the shoe was priced at a hefty $180 and didn’t sell too well. But after its re-release, the basketball sneaker has become a regularly sold out item. The Foamposite Pro features a hard yet flexible molded upper. Easy to clean and not that easy to scuff, the upper provides premium support and protection to the foot. The inner sleeve uses the Dynamic Fit technology, allowing it to give a snug fit no matter what the shape of the foot is. The midsole is super generous with its cushioning as it uses a full-length Zoom Air unit and adds another layer of Zoom Air in the heel for ultimate impact absorption. A stable base is ensured via the carbon fiber midfoot plate. Rarely seen on-court, the Metallic Gold colorway is more often worn casually or considered as a collector’s item. Celebrities like Raashaun Casey and Nigerian-American rapper Wale have been sighted wearing the gold colored basketball shoes. Designed to be aggressively stylish and seamlessly modern, the Nike LeBron 15 is reportedly LeBron James's favorite shoe to date. Though similar in silhouette as the previous model, the Lebron 15 uses an improved version of the Flyknit called Battleknit. This new material looks like chainmail and is more durable and supportive than its predecessor. However, it is just as light with a sock-like fit and top-notch breathability. The upper’s structure is focused on the lateral and medial sides to provide support to them during hard cuts and crossovers. The tongue and ankle areas, however, are stretchy and make putting on or taking off the shoe easy. The shoe also showcases a new midsole technology as James puts prime on underfoot cushioning. This involves merging Zoom Air and Air Max, creating a full-length articulated cushioning system that feels just as comfortable as the Lebron 10. The Lebron 15 just has a smoother transition because of its segmented midsole. For GQ's 60th Anniversary issue in 2017, LeBron James graced the covers of the magazine wearing the Nike Lebron 15 in the "Gold" colorway. The extremely luxurious-looking colorway was custom-made by Dominique Chambrone, or more popularly known as the Shoe Surgeon. The attractive gold basketball shoes come in a metallic gold Battleknit upper and a translucent outsole. Before LeBron James was a four-time NBA MVP and a three-time NBA Champion, he was an eighteen-year-old kid from Ohio who had been dubbed as a future NBA superstar. Nike took a huge gamble and signed James to a seven-year $90 million contract. Although it does not bear his name, the Nike Zoom Air Generation is regarded as LeBron James’s first signature shoe. The shoe’s silhouette was inspired by the controversial H2 Hummer that James received as an eighteenth birthday gift from his mother Gloria. Designed by leading footwear designers Aaron Cooper, Eric Avar, and Tinker Hatfield, the Air Zoom Generation features a forefoot Zoom Air unit and an Air Max heel cushion like some LeBron basketball sneakers today. Before starting the project, Cooper promised James that they would design for him the “most comfortable basketball shoe” he has ever worn. The key to this was the cushioning setup and the Sphere material used on the shoe’s inner lining. At that time, the material was new and initially used on sports apparel, but was later on applied to sneakers. The soft textile has a dimpled surface to prevent it from sticking to the skin when moist with sweat and to allow better air circulation and comfort. Designed by Leo Chang, Kevin Durant's fourth basketball sneaker was debuted in 2011. Featuring a Hyperfuse upper, an Adaptive Fit strap system in the midfoot, and a forefoot Zoom Air unit encased in a Phylon midsole, the shoe is a great on-court performer. The lockdown is the shoe's highlight as the straps are connected directly to its midfoot arch. Once pulled and harnessed, these straps securely fasten the foot to the footbed. The shoe was what Durant wore when he led the Oklahoma City Thunders to victory in the Western Conference Finals against the San Antonio Spurs, giving his team a shot at the 2012 NBA Finals. Unfortunately, they lost to LeBron James and the Miami Heat in a 4-1 series. However, all was not lost for that year as Durant together with Team USA won the Gold Medal at the 2012 Summer Olympics held in London. In honor of that Olympic victory, a "Gold Medal" colorway was released in the same year and was worn by KD during his signature athlete tour in China for Nike Basketball. The Three Stripes does a great job telling stories through golden colorways. 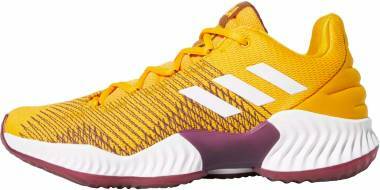 Discussed in the subsections below are some of the most notable gold colored basketball shoes Adidas has ever released. The second iteration of Damian Lillard's Adidas signature kicks, the D Lillard 2 was a designed to be a shoe that not only enhances Lillard's performance but also inspires him on the hardwood. Compared to the first model, this shoe integrates more personal details about the Portland Trailblazers point guard. The linear patterns on the shoe's heel, lacing system, midsole, and outsole all come from the Oakland City Tree logo. The forepart of each shoe’s sole has “Oak” and “Land” on it, forming the name of Damian’s place of birth when these Dame basketball shoes are placed side by side. This “Oakland” design matches the tattoo on Lillard's chest. As for the shoe's techs, full-length Bounce constitutes the shoe's midsole cushioning while the outsole is made of Continental rubber. The traction pattern is extended up to the front as Damian is known to always play on his toes. Lockdown is ensured by the internal Techfit bootie and molded TPU eyelets. The shoe is released in four different types of upper material, namely, Jacquard, Primeknit, Synthetic leather, and knitted. Each colorway of the Lillard 2 has a story to tell. The "Fool's Gold" colorway speaks about the aftermath of the California Gold Rush in the mid-1800's. The edition specifically pays homage to the people who stayed after the hype died down and built the Bay area with grit, persistence, and hard work, instead of just trying to get rich quick. Damian believes that it is these values that bring true success in the end. The special colorway is outfitted with a gold foil upper that is contrasted by the dark gray heel and tongue. The sole and laces of these gold colored basketball shoes come in an icy green color, speckled with gold accents. Three years after he inked a massive $200 million signature shoe deal with Adidas in 2015, James Harden’s second signature basketball shoe is out. The Beard prioritizes comfort, lockdown, and traction. These are obviously epitomized by the very thick Boost midsole cushioning, the customizable lacing system, the thick elastic band on the midfoot, and the data-driven fractal-patterned outsole. The shoe's forefoot mesh area is fused with TPU threads called ForgeFiber; this combination creates structure and support for areas that need extra protection. The shoe was originally released in three colorways that tell of James Harden's love for the state of California, his commitment and drive for his team the Houston Rockets, and his LA-based Middle School where his vision of becoming an NBA superstar came into being. Months later, the Black and Gold colorway was released. Similar to the "Imma Be A Star" colorway, the shoe came in a predominantly black upper; however, this colorway came with gold hits in the laces, heel pull-tab, and Adidas brandings. The whole outsole is gold and it completes the shoe's luxurious feel. Obvious love-hate first impressions are usually made of early Kobe Adidas shoes. 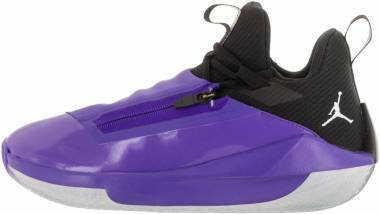 In fact, the Kobe II, now called the Adidas Crazy 2, was said to be the shoe that drove Bryant out of his contract agreement with the German footwear company. The Crazy 1, (previously known as Kobe I) though also futuristic in appearance, is a bit more wearable and a little less eccentric. The shoe's silhouette is inspired by Bryant's Audi TT Roadster and is often called the "space boots." Basketball fans who have been there since Bryant's beginnings will recall these sneakers fondly as they were desirable hoop shoes back then. Traction uses a standard herringbone tread pattern that proves reliable on indoor and outdoor courts. The shoe's heavily padded upper and EVA midsole hike its comfort up a notch. Adidas together with Packer Shoes, a New Jersey-based retailer, created a new colorway for the Crazy 1 called the "Awards Season". Released during the Grammy Awards time, the colorway is inspired by the event and the gramophone trophies that are given away. The Crazy 1 Awards Season features a gold foiled upper with red hits on the ankle to give it a red carpet feel. Players Iman Shumpert from the Sacramento Kings and Avery Bradley from the Los Angeles Clippers debuted these gold basketball shoes on court in 2014. Gold: What Does It Stand For? The word "gold" comes from the Old English "Geolu" that means "yellow". The chemical symbol "Au" is the short version of "Aurum" which loosely means "morning glow". These describe both the color and mineral as both of them are both yellow-based and have a shine to it. Gold is known to be one of the most malleable metals. It can be shaped or bent into a different form without the use of heat or fire. The metal does not react with any other substances. Thus it does not rust, tarnish, or lose its sheen. Since it is easy to manipulate and has an attractive color, our ancestors used them for jewelry and decorative products. Its rarity, beauty, and usefulness make the precious metal so highly priced that it has become a symbol of currency, royalty, wealth, and power. In fact, because of its ascribed value, people travel halfway around the world just to get their hands on, such as the California Gold Rush or some of the expeditions of old. The precious mineral has also been associated with divine and religious concepts, and gold is usually used to create images or shrines. Now, gold is used in honoring great achievements. The Grammy Awards, Oscar Awards, the Nobel Prize, and even the Olympics give away molded tokens, usually golden trophies or medals. Use a damp cloth to wipe off dirt and grime. For harder stains, mix warm water and a few drops of mild soap, and then buff the shoe with a clean cloth dipped in the soapy solution. Oils such as olive oil, mineral oil, or Vaseline can also be used as a substitute for the soap solution. Just use a clean dry cloth with the oil and wipe away. Let’s be honest; not too many people really want to wear gold colored basketball shoes on-court. Unless you are as fashion forward as Dennis Rodman or Russell Westbrook, your gold basketball sneakers will just be a statement piece for casual wear or big dressy events. If you would like to have a cohesive and high-end looking outfit, avoid clothes with “dead colors” and instead go for richer and elegant hues such as emerald green, purple, maroon, burgundy, navy blue, or black to bring out gold’s rich color. If worn just casually, don’t wear your gold basketball shoes with pieces that are too busy. 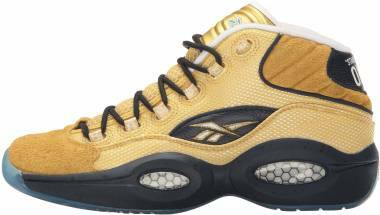 But if you really want to, just limit it to one busy piece as basketball shoes in gold are already bright and flashy, and you want them to take the center stage. Of course, these fashion rules are not set in stone. 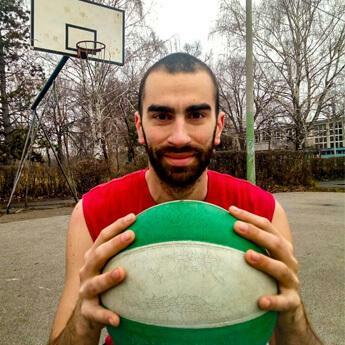 Just feel free to experiment with your different outfits and see which pieces go well with your gold basketball shoes. Where can I find gold basketball shoes for sale, you ask? Usually, gold colorways are special editions or limited releases, and they are released a few months (or even years) after the original colorway debuted. These shoes are most of the time elite or lifestyle versions of performance basketball shoes and other performance footwear. If you want to get the shoes as lower prices, the rule of thumb is never to buy them when they are first released. Normally, this is the time when the prices of the gold colored basketball shoes are at its peak. Wait for a few months and there will surely be gold basketball shoes for sale waiting for you.